Wagamama is a japanese restraurant and noodle bar founded in 1992. It's one of those places I have always heard about and walked passed but never considered it somewhere i'd choose to eat. So when I was visiting my step mother and my dad in York this past weekend, and very little choice elsewhere in the McArthur Glen outlet for a pescetarian such as I and so why not try somewhere completely new? The staff at the entrance were handing out Chilli Squid in little pots which was absolutely amazing. It wasn't tough at all as i've experienced before and was extremely light to say it was a fried dish. I later found it on the menu it's described as 'deep-fried squid seasoned with sea salt and shichimi. served with a chilli garlic and coriander dipping sauce'. The staff were extremely friendly and really helpful in offering to advise us with the menu as she'd 'eaten everything, tell me what you want and I can help you.' After finally deciding on what we were going to have we patiently waited seated by the open kitchen where they prepared our freshly made food for no longer than 15 minutes. We got excited at the sight of chopsticks and I challenged my sister and brother-in-law to eat using them. The atmosphere was so welcoming and the staff laughed along as we questioned whether we were using our chopsticks correctly, 'If you can eat with it, it's right' she joked. I had ordered the Prawn Kare Lomen which caught my attention immediately and I decided on it straight away. 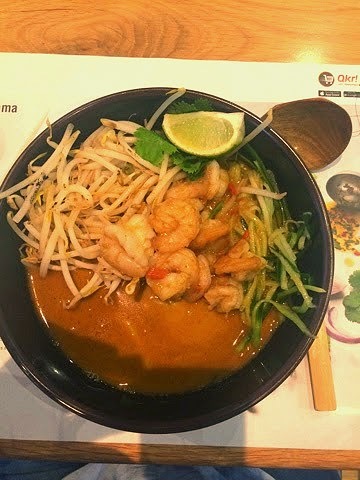 This is described on the Wagamama's website as 'ramen noodles in a spicy coconut and lemongrass soup topped with prawns, cucumber and beansprouts. garnished with coriander and lime'. Although I was shocked by the consistency of the, what I thought would be curry, everything else was exactly as I had expected. The whole dish was so light and different to anything I had eaten before and tasted A-mazing! The service did not make you feel alienated in anyway, and if you hadn't eaten there before the members of staff present were more than happy to make sure you ate exactly what suited your taster. It did genuinely seem as though they really wanted you to enjoy your food and time with them. I can honestly say it is the best quality food I have ever had from a chain restaurant. My dish was filling yet not heavy, and although I got it all over me (bloomin' chopsticks) I definitely enjoyed it. I think it may even be my new favourite meal. And guess what? I mastered the art of chopsticks too! Have a look at what I ate here: Prawn Kare Lomen. 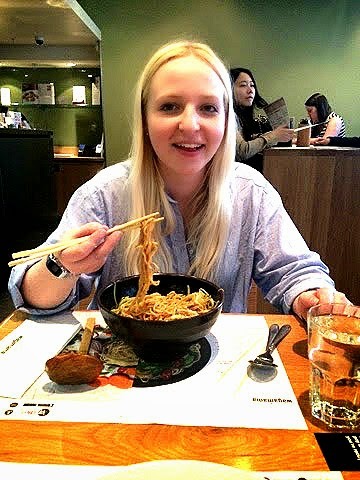 Have you been to Wagamama's too? what's your favourite dish? Let me know in the comments below!